The rift between "establishment" candidates and their tea party challengers is as much about incumbency this year as ideology. In the challengers' narrative, a long tenure in Washington brings lassitude and complacency to the conservative cause; those officeholders compromise too much - or spend too much - but don't challenge the D.C. status-quo enough. As the establishment tells it, incumbency brings clout, in that classic "all politics is local" way: it steers spending back home and gets the funds that come more easily to lawmakers with seniority. We saw this debate in Kentucky - where the establishment prevailed easily - and we were watching it in full force in Mississippi, in what might have been the most compelling fight contrasting these two themes. That was before the scandal took over. 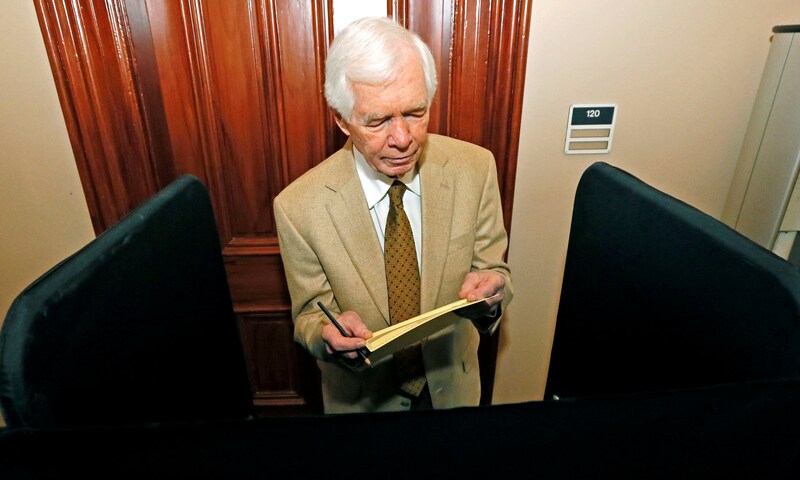 A few months ago incumbent Sen. Thad Cochran, R-Miss., seemed potentially vulnerable. Cochran, elected in 1978 and seeking a seventh six-year term, seemed to fit that profile of a long-time incumbent in a state where Republicans are staunchly conservative, and he'd drawn the ire of national conservative groups who were angry about debt ceiling and budget deals. They'd hoped to replace him with what they considered a movement conservative, tea party challenger. Cochran's campaign had stressed all that he's done for the state, hoping that voters would reward him for his efforts including after Hurricane Katrina, especially. The political reality, often, is that spending in principle is usually derided by all sides, but funds that help one's state in times of crisis are often welcomed. Challenger Chris McDaniel's campaign was invoking the idea that Cochran was past his prime, and McDaniel wasn't new to political campaigns, as a state senator, so many wondered if his campaign could avoid the gaffes and missteps that have hurt tea party insurgents this year and in the last two cycles. Then a conservative blogger who supports McDaniel was arrested after photographing Cochran's wife, Rose, in her nursing home which many immediately decried as an invasion of privacy. McDaniel has denied ties to the blogger and condemned the action, but the incident has proved inescapable for him so far. Cochran's campaign - though not the senator himself - has made the transgression part of its ads. That pushback could work heavily in Cochran's favor Tuesday, as it is the kind of incident that can undermine challengers who aren't as well known going in. In general, voters don't usually replace incumbents if there are doubts about the challenger. The race is not a slam dunk. It's a June primary - in the late spring/early summer, even more so than usual, many voters feel they've more options for things to do other than stand in line to vote. Plus it's a low absentee/mail state, meaning this is a one-shot campaign effort in which only the most committed, more ideological voters could turn out disproportionately, potentially helping McDaniel. If Cochran hangs on, it's another win for the "establishment" and the first explanation is bound to be the nursing home scandal. What it'll mean is up for debate. Did it distract from or disrupt what might have been a viable anti-incumbent challenge? Or did it prove exactly the point the "establishment" wants to make this year: that it's hard to run campaigns; that challengers have less room for error - real or perceived - with the electorate, even in supposedly anti-incumbent years. And with Senate control on the line, plenty of Republicans think there isn't a lot of room for error. Iowa could be another crucial Senate state this fall, as the retirement of Democrat Tom Harkin has left the seat open. The state leans Democratic these days, but Republicans see it as a pickup opportunity. A Des Moines Register poll has Iraq War veteran and state senator Joni Ernst leading the field for the race for the GOP nomination, which has centered on much the same themes we've seen elsewhere, touting conservative credentials, cost-cutting and a balanced budget, and opposition to Obamacare. Ernst, you may recall, got national attention for an ad that highlighted her, ahem, farm experience with hogs (specifically, castrating them) and promising to make the big spenders in D.C. squeal. In the national context, this is another state where Democrats had hoped that the Republican nomination fight could produce a GOP candidate too far right to win a general election. It's unclear that's been the case, and that concern may help explain a wide range of funding and backing behind Ernst. As in other GOP Senate and House nomination fights, the U.S. Chamber of Commerce has gotten into this contest - in support of Ernst - as it tries to steer 2014 nominees toward its choice of pro-business conservatives. It has previously helped more "establishment" picks defeat tea party challenges so far this spring. She's also gotten backing from across the conservative spectrum, including Mitt Romney. But there's still a wild card. The winner needs 35 percent in a crowded field to avoid the nomination going to the state Republican convention vote, where a smaller group of activists could have more leverage. The Democrats will nominate Rep. Bruce Braley, who represents the Cedar Rapids area. An interesting side note in that Des Moines Register poll that offers another window into Iowa Republicans' views: it asked voters about the impact of endorsements and candidate qualities, and found Romney's backing generally made Iowa Republicans more likely to vote for a candidate. Military service, and Wall Street backgrounds were also positive influences. Also very positive was being a Christian conservative - as we often see in Iowa presidential primaries. The poll also suggests low levels of engagement among the Republican electorate, with just 9 percent having taken advantage of absentee early voting so far, which can be an early indicator of turnout on election day. In Montana, the primaries should formalize what many expect to be another competitive (but probably Republican-leaning) Senate race contest. Rep. Steve Daines, R-Mont., is favored for the GOP bid against Democratic nominee Sen. John Walsh, who was appointed to the seat after Democrat Max Baucus stepped down to become ambassador to China. Baucus' retirement was another in a series of Democratic retirements (the aforementioned Harkin, Sen. Tim Johnson in South Dakota, Sen. Jay Rockefeller in West Virginia) that brought an added degree of difficulty for Democrats' 2014 prospects. The 33rd district, covering Los Angeles and Beverly Hills - among the wealthiest districts in America and solidly Democratic - has seen a tough primary race with multiple candidates vying to replace retiring long-time Rep. Henry Waxman. Without a lot of polling here, it's anyone's guess who's favored. Among the more well-known names in the area are state senator Ted Lieu, L.A. City Controller Wendy Greuel, and attorneys Matt Miller and David Kanuth.